Ampelmann tells the story of Fritz, a Berlin construction worker with an active imagination and a dream of becoming an architect. 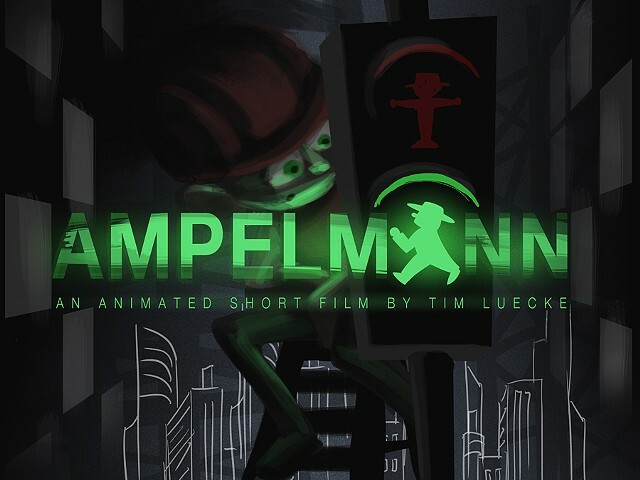 Forced to spend his days installing and repairing traffic signals (Ampelmännchen), Fritz struggles to find the confidence necessary to fully pursue his dreams–until the night when his unassuming traffic signals convince him to consider the world from a new perspective. Ampelmann draws upon a brief but powerful visit to Berlin during my summer studies in Europe. I was struck not only by the funny little traffic signal men of East Berlin's past, but by the perpetually changing nature of the city–ever evolving, with cranes and construction sites as far as the eye could see. From these observations, I began to develop the story of a worker bee visionary who dreams of contributing something more to the dynamic face of the city–and what it might take for him to realize the depth and strength of his own vision.